3 Alarm Fire Destroys Warehouse. JIM VAIKNORAS/Staff photoA Salisbury firefighter douses the flames at a house fire Saturday afternoon on Second Street in Salisbury. SALISBURY — A little less than 24 hours after a swift four-alarm fire threatened to destroy the Rings Island home where he was born, town harbormaster Ray Pike was back inside Sunday morning taking photographs of the damage. “I may cry in a week or two. I feel like, like I screwed up, that I caused all this mess,” Pike said. While the official cause has yet to be released, Pike said he lit a fire inside a pot belly wood stove outside next to the garage shortly before noon and went inside the Second Street home. About 35 minutes later, a neighbor screamed that the garage was on fire. “I couldn’t believe how much it had gotten out of control,” Pike said. As firefighters from numerous area departments tried to stop the blaze from spreading to the house, Pike and his wife, Wendy, and daughter Gillian escaped unharmed. “I started the wood stove fire. I’m responsible, I screwed up,” Pike said. Salisbury fire Chief Scott Carrigan hesitated to confirm that the wood stove caused the fire, saying there were other possibilities. Due to the amount of damage in and around the garage, the official cause could be classified as undetermined. The five-bedroom house was built in 1800 and is assessed at $169,500, according to the town assessor’s database. The entire property, including land, is assessed at $596,700. Carrigan said he feels strongly that the house can be saved. “Structurally, the building is sound and I have no doubt it can be restored,” he said. Pike said he plans on rebuilding, but in the meantime, he and his family will stay in a house he co-owns with his brother and sister just down the block. Pike and a friend were back inside the home about 10:30 a.m. on Sunday, taking photographs of the damaged interior. His kitchen featured several blue tarps placed over a table and a computer by firefighters to spare them from water damage. “That was more than nice,” Pike said. 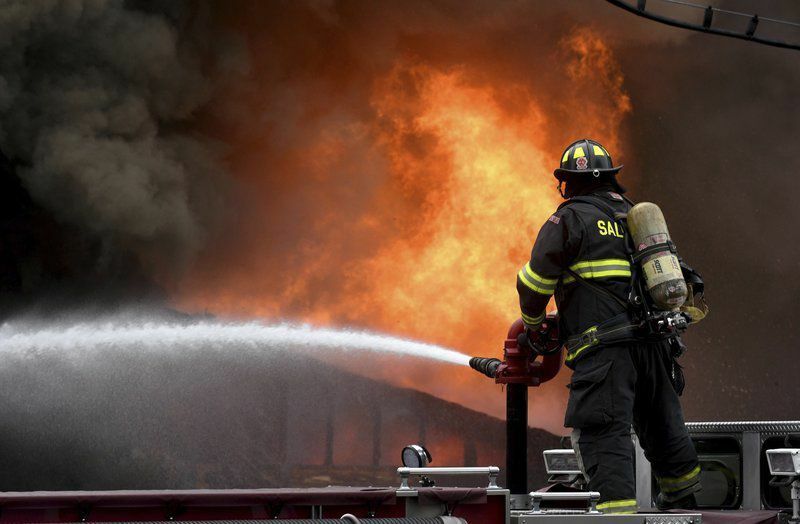 Among the departments that responded to the fire were Newburyport, Merrimac, Amesbury, Newbury, Byfield and Rowley along with South Hampton, Hampton Falls and Hampton in New Hampshire. Firefighters from two other New Hampshire departments, Kensington and East Kingston, covered the Salisbury fire station during the call. The home is in a densely populated section of Salisbury near the Merrimack River. Firefighters were at the scene from about 12:30 p.m. until approximately 7 p.m., Carrigan said. Due to ongoing construction and several hidden spaces, it took firefighters considerable time to extinguish all hot spots. Carrigan said the combination of the first team’s quick response, along with mutual aid from area departments and the overall hard work of firefighters, prevented the blaze from becoming much worse. “I’m extremely proud of our firefighters,” Carrigan said, adding that he was very appreciative of every firefighter who responded. Large, billowing plumes of black smoke could be seen miles away, including across the river in Newburyport, according to observers. Staff writer Dave Rogers can be reached at drogers@newburyportnews.com. Follow him on Twitter @drogers41008.